Trying to establish a meaningful chronology for domestic porcelain is at best problematic. Whilst there can be no doubt that Meissen 'invented' European porcelain first and tried unsuccessfully to guard the secret, how and where the secret leaked out or whether a series of scientists and alchemists stumbled upon their recipes simultaneously is unclear. 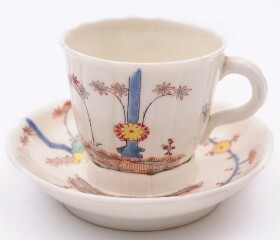 A Saint Cloud treumbluese cup and saucer, circa 1740. It has be argued that Saint Cloud in France actually managed to make porcelain as early as the 1690s, but certainly a patent to make 'some form of porcelain' was granted by 1702. However, 'some form of porcelain' was not the Oriental or hard paste porcelain - that honour (after Meissen) went to Du Pacquier in Vienna, who enlisted the help of a Meissen escapee and went into production shortly after 1718. 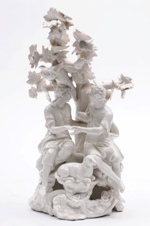 A Vienna porcelain figure group, circa 1750. Next on the scene with soft paste porcelain was another French manufactory - that of Chantilly, north of Paris, which was making Facon de Japon porcelain by 1725, the bulk of which, as the name suggests, was decorated in the Kakiemon manner and palette. 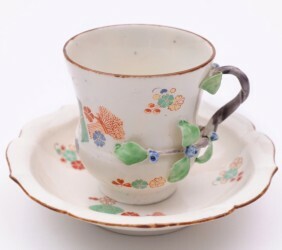 A Chantilly cup and saucer, circa 1735-40. By 1735, after many years of living and travelling in China, the Jesuit priest Pere d'Entrecolles openly published the secrets of porcelain and this lead to a speedier proliferation of porcelain manufacturers. By the 1740s, the French were producing porcelain in Vincennes, Mennecy and the Italians in Doccia. However, outside of Meissen, it is the former of this group (with the useful aid of royal patronage) that became Sevres porcelain, one of the most productive, highly prized factories. 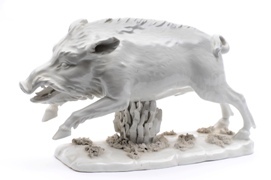 A Frankenthal porcelain boar, circa 1777. By the latter half of the century, there were literally many hundreds of porcelain producers throughout Europe.